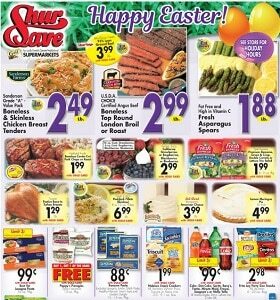 Gerrity's Weekly Flyer April 14 - April 20, 2019. Happy Easter! Gerrity’s Weekly Flyer April 14 – April 20, 2019. Happy Easter! -$1.88/lb Fresh Asparagus Spears; $3.99 Nabisco Single Serve Multi Packs. To see the weekly circular for your favorite Gerrity’s store, search by ZIP Code or city, state. Rite Aid Weekly Ad April 14 – April 20, 2019. Stock Up For Easter!